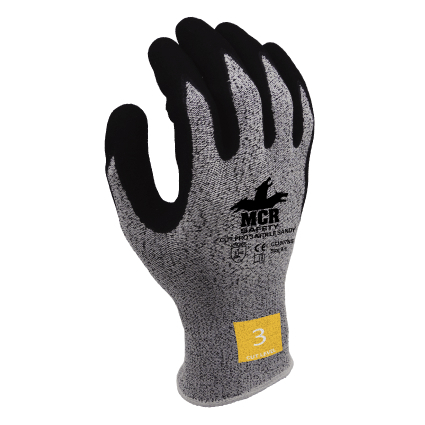 The MCR Safety Cut Pro CT1007NS Sandy Nitrile Palm-Coated Work Gloves are lightweight knitted work gloves with textured nitrile palm coating that enables excellent grip in dry, wet and oily conditions. With an EN 388 cut resistance rating of Level 3, and outstanding resistance to both abrasion and tear, the CT1007NS Gloves are suitable for applications that carry a medium cut risk, including automotive work, metal fabrication, construction, carpentry and steel manufacturing. The Cut Pro Nitrile Foam Palm-Coated Work Gloves are available in sizes 7 - 10, one of which should suit the hands of most users. Please measure the circumference of your hand around the knuckles (excluding the thumb) with your hand open and your fingers together, and the length of your hand from the tip of your middle finger to your wrist.